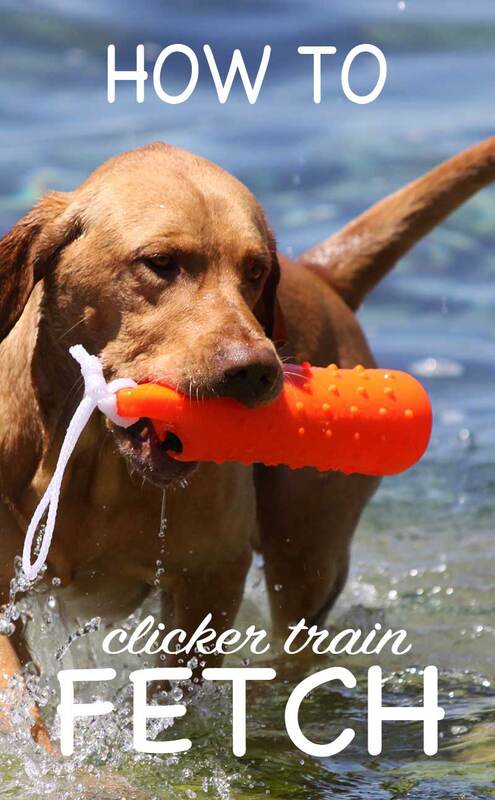 Welcome To Our Complete Guide To Clicker Training Fetch. Learning How To Teach The Clicker Retrieve, With Positive Reinforcement Dog Training Expert, Elsa Blomster. 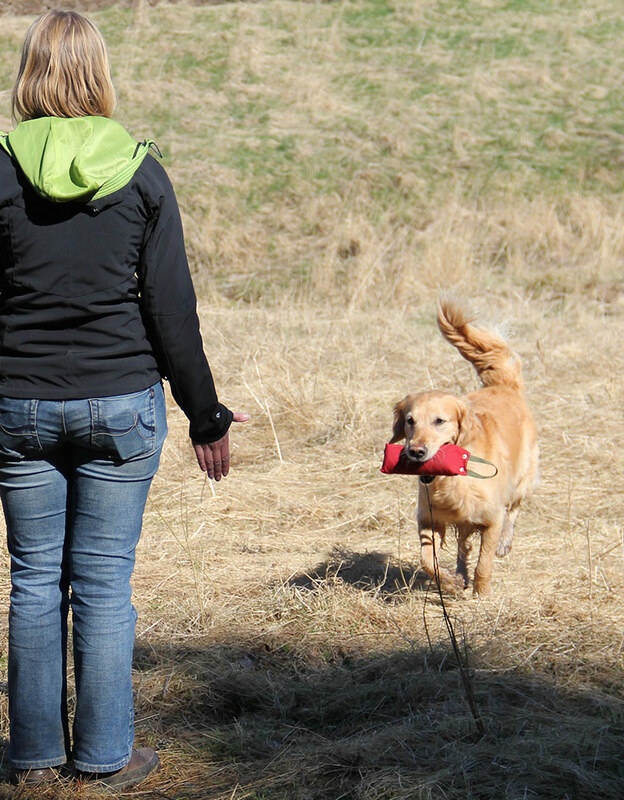 Retrieving using the clicker philosophy means that we put the spotlight on the correct behavior. That’s what we do when we train our sporting dogs. 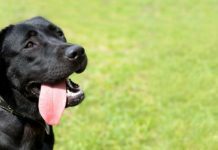 In this article we’ll explain what the clicker philosophy means and how we use it to teach our dogs to take objects and deliver them to us. 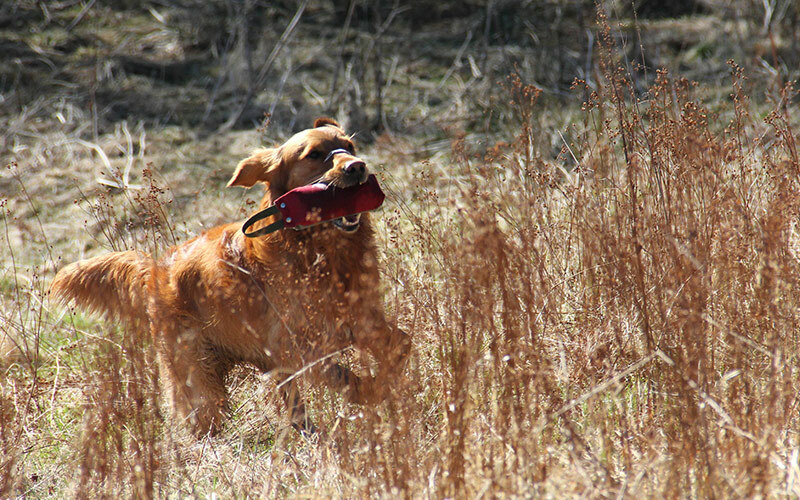 Two important foundations for sporting dog training and for teaching any dog to retrieve. We focus heavily on setting up our training so that the dog succeeds. Then we can reward her for doing the right thing. We work with what is known as positive reinforcement. Don’t think about positive in the everyday sense but rather in terms of mathematics. Positive means plus (+), which means we add something. Positive reinforcement thus means that we add something we know the dog wants. For example, you say “sit”. The dog sits. You give it a ball. Setting up the training so the dog gets it right and we get to reinforce the behaviors we’re looking for is one of the guiding principles of our training. But what do we do if the dog does something wrong? We withhold the reward we intended to give the dog for the correct behavior and we also prevent her from rewarding herself, for example by maintaining control of the reward or leashing the dog. This is called negative punishment. Again, think in mathematical terms. Negative means minus (–), which means we take away the reward. This is a type of punishment in that the dog has been cheated out of her sweet. For example: You say “sit”. The dog continues standing, staring at you. You don’t give it the ball you intended to give it for sitting. 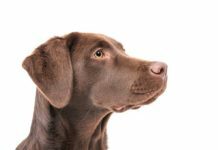 We want the dog to look forward to the reward and be really happy about it – and feel a little disappointed and frustrated if she doesn’t get it. The dose of frustration and disappointment should never be so great that the dog gives up and stops working. Instead, we want her to be enthusiastic about trying again. A little frustration is necessary to make progress with training, but there should always be a great deal more joy than frustration when clicker training fetch! When the dog does something undesirable, we can also use extinction, which means we ignore the dog’s incorrect behaviors. We don’t see extinction as particularly useful for field trial training, but there are situations we encounter in daily life where it’s applicable. For example, a dog that shows off her tricks to get a treat when we are eating: We ignore her and continue to eat. We always use reward markers in our training. 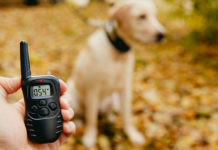 Most often we use a clicker, but it might also be a particular word, a whistle, a sound or something else that tells the dog, “What you are doing now is exactly right and you will get a reward for it”. You might have heard the whistle during a dolphin show. The whistle means, “That vault was excellent, come here and get a fish”. In field trial training, however, we use the whistle as a cue and not as a reward marker. The final goal of our training is that the dog voluntarily offers behaviors. 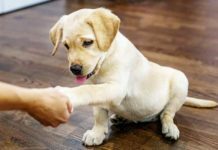 Almost all learning begins with the dog offering a behavior voluntarily, without being lured or for that matter threatened. Learning occurs more quickly, and the behavior will be more reliable and stable, if the dog determines how and when to do it. The dog will also be more engaged this way. The dog will think training is fun and you can skip using unnecessary aids. We can also use voluntarily offered behavior if we want to reteach or further develop a behavior, such as shaping a crawl from a down. And this, dear reader, is clicker training! It’s not as much about the little box called a clicker as it is a training philo¬sophy that comes from behavioral psychology and the laws of learning. How do we then use this in our hunting dog training? Well, we make sure to find many good rewards that the dog is willing to work for. 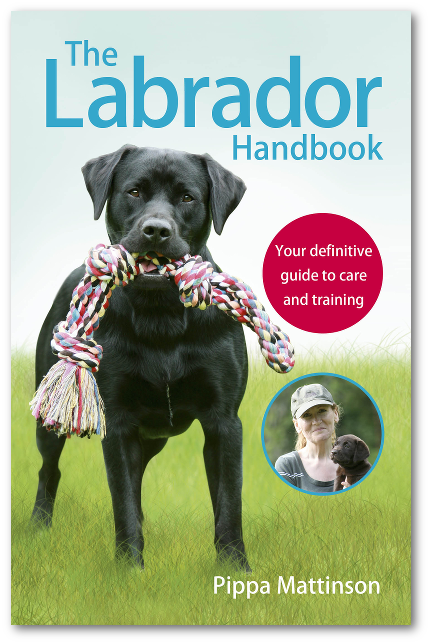 For example treats, toys and, when the dog really likes the gun dog work, to be allowed to continue to work. To get reliable behaviors we also do a lot of proofing. That is, training with distractions. Naturally we adapt the distraction to the dog’s level. Too difficult distractions will make the dog fail and too many failures will not make for a good learning outcome. At a close distance it’s much easier to influence the dog’s behavior and teach it what we want it to do. Therefore, we start adding distractions when the dog is close to us and when it has mastered that we increase the distance. We always start with easy distractions and then gradually make it more difficult. Put your dog on your left side and hold the dummy in your right hand at the same height as the dog’s nose. Spin to the right and have the dog chase the dummy and grab it. When the dog takes the dummy, let go of it and back away from the dog so she follows you. Click and reward the dog when she immediately turns towards you. In the beginning, what we want is to have the dog look back within a second after the distraction. Then that she only glances at it and eventually turns towards you right away without even acknowledging the distraction. If it becomes too challenging and your dog goes to check out the distraction, silently bring the dog back and make a new, easier attempt. Vary the distraction (increasing or reducing the difficulty) so that the dog is successful most of the time. Remember that success is the main way that will teach the dog what we want her to learn. If the dog becomes too excited when she chases after the dummy, wait to give it to her until she’s calm. Have the dog take the dummy from you when you are standing still or when she has offered a sit. Then try turning away from your dog slowly and have her take the dummy while you are still moving. When she can take the object from your hand even when there are distractions, experiment by doing the same thing with the dummy on the ground. If it’s too advanced and your dog doesn’t perform well, make it easier and try again. If the dog’s holds become sloppier and sloppier, remove the distractions and practice taking the object from the ground again. A helper claps her hands? There is another dummy on the ground? A helper holds out a piece of ham? There is a hamburger on the ground? If yes, then you’ve proofer your deliveries well! If the dog doesn’t get it right, start with an easy distraction and then gradually increase the difficulty again with lots of successful repetitions and your dog will soon have the best deliveries in town! Does your dog drop the object from her mouth as soon as you take treats out of your pocket? It’s easy to assume that treats don’t work in this situation and that it’s time to put them away. But that assumption is wrong, and you won’t teach your dog to hold on to the object that way. We want the dog to learn that it’s worthwhile to hold the object despite the distraction of the treats. Furthermore, if she holds the object, she will be rewarded. We call this “reverse luring” because we pretend that we are trying to “entice” or lure the dog to drop the object. We want the dog to think, “Ha! You’re trying to trick me. I’m definitely not letting go”. Reverse luring can be used in any training as an initial controlled distraction. When the dog is playing with you and holds the toy with a firm grip, show a treat in your open palm. If the dog keeps holding, give your release cue (”thank you”, ”dead” or whatever cue you use) and reward the dog. When the dog lets go, close your hand and get the dog to play again. 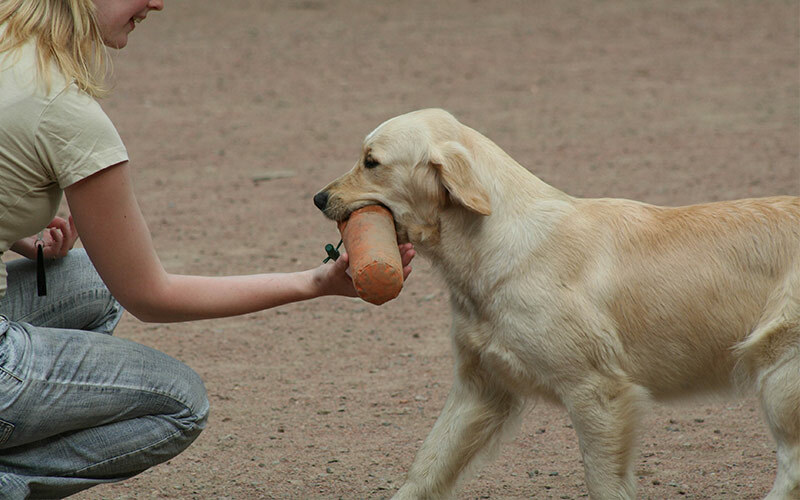 You closing the hand (and the dog thus losing the chance of that treat) combined with getting the reward when it keeps holding the toy is important information for the dog on what’s rewarding and what isn’t. In the beginning the dog only needs to keep holding for a short, short while – perhaps just half a second. Then you gradually increase the time and move the treat closer to the hand. If the dog just goes for your hand and ignores the toy. Use the best toy you can find (a soft, fluffy one) and a boring treat (kibble or dry bread) and most importantly – don’t give up! Continue to play with the toy and make it interesting by moving it away from the dog and you’ll see that the dog soon will get the concept. Reverse luring can be used again later by increasing the level of distraction, such as dropping treats on the ground. Start by dropping the treat behind you, near your foot, so you can put your foot on it if the dog attempts to take it. As the dog becomes more skilled, drop the treats closer to her. Most dogs get really skilled at this after a while. A fun complementary exercise is to throw the treats closer and closer to the dog. By the end, you should be able to throw an entire fistful of treats at the dog’s feet without her going for them. Don’t make it too hard at first, but gradually increase the difficulty. The biggest challenge for the handler tends to be remaining completely silent during the exercise. If you feel the need to say “no”, clear your throat, or stop your dog, you’ve made it too difficult. We control the treats, and the dog learns to control herself. Another way to “distract” the dog is to play with other toys or have some of your friends try to make the dog lose concentration. But remember that the dog should succeed almost every time. Delivery to hand is one of the most important skills we can teach our dogs when it comes to clicker training fetch. As soon as the dog finds game, she should pick it up and come straight back to us at full speed without caring about what else there might be to find. 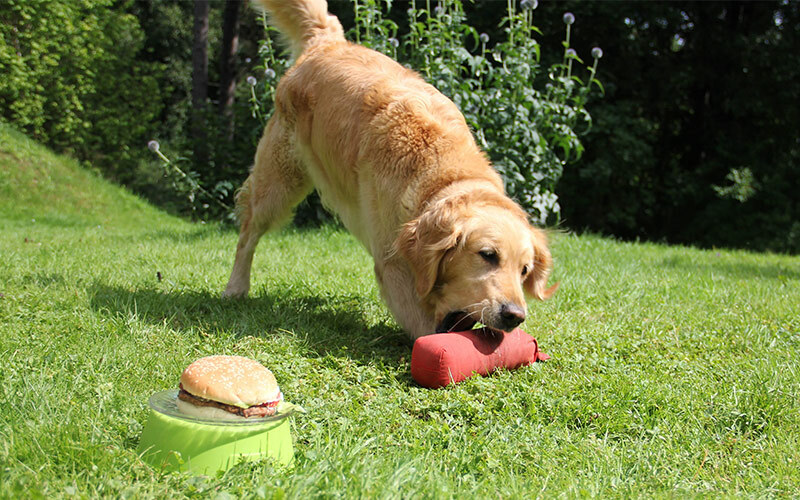 A lot of dogs spontaneously run after and pick up objects. But bringing back those extremely interesting discoveries isn’t always as much fun, so that’s something we need to teach the dog to love. The most important things to do is to reward the dog generously when it gives objects to you and to train a lot with distractions. Earlier we described how we start to teach taking and holding while playing. At the same time, we also use play to teach the dog delivery to hand and to like to be near us with an object in its mouth. This game teaches the dog to quickly take an object, run toward us with it and release it. Start with two identical toys and get the dog playing with one of them, just as you did in “Play is Something We Do Together”. Instead of letting go of the object the dog is playing with, become passive with the object to encourage the dog to switch to the other toy. Say “yes” and start playing with the other toy exactly when the dog switches. Repeat this until the dog changes toys as soon as you say “yes”. Now you can start throwing the toy a little bit away from you. When the dog takes the toy, say “yes” and offer the other toy so the dog will spit out the toy she just took and start playing with you instead. Gradually throw the toy further away. Later, you can have the dog run a bit further towards you before you say “yes” and switch to the other toy. Finally, the dog should be in front of you before you reward her. Then you can start combining this with delivery to hand, but even at later stages in your training you can come back to this game to work on holding and running back to you at high speed. You can also try a different version of this game by throwing different kinds of objects, dummies and birds. It’s a good exercise to use to teach the dog to run straight back to you with anything she finds. 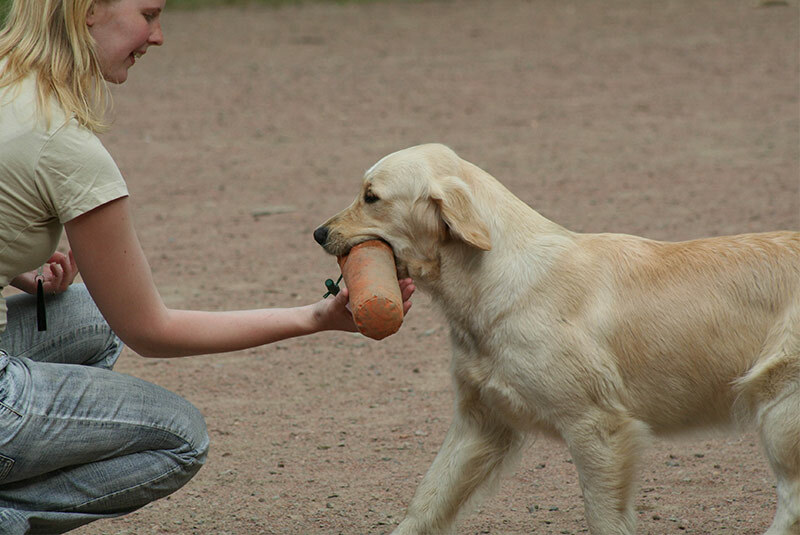 In clicker training fetch, we use the hand target to teach the dog to deliver objects to our hand, so we don’t have to just catch the object or pick it up from the ground. Teach the dog the hand target by holding the palm of your hand two inches or so from the dog’s nose. Click and treat when it stretches its nose forward and touches your hand. Make sure that it’s the dog that’s actively touching your hand and not the other way around. Then try putting further and further away from the dog so it must move to be able to touch your hand. If the dog just looks at the hand you’ve made it too difficult. Remove the hand and then present it again, closer to the dog’s nose. When the dog has learnt to put its nose against your hand you can start varying the exercise. Place your hand in different locations: High, low, in front of you, behind you and so on. Move your hand a little so the dog gets to chase it. Also vary which hand the dog touches so that it can do the behavior just as well with your left hand as with your right. Now we’re going to combine the hand target with and object that the dog gets to deliver to our hand. It’s a good idea to just let the hand target training without object seamlessly move into training with objects. Start with rewarding the hand target a couple of times. Then get the dog playing calmly, let go of the toy, back away from the dog, present your hand and let the dog touch your hand with the object in its mouth. Click and treat! If the dog drops the object as you present your hand target, remove the hand, pick up the object yourself and try again. If the dog doesn’t care about the hand target you have to practice just the hand target more and maybe use a less interesting object. Remember to be close to the dog when you do this. Be silent until the do has delivered the object to you hand. If you feel the need to encourage it to get it to hold on the object you’ve made the exercise too difficult. When the dog understands that she should deliver the object to hand, we start introducing various distractions. It might be someone saying “hi”, falling dummies, dummies to jump straight over, or treats in a bowl. At this point we can introduce distractions at three different stages: when the dog is on her way to the object, when the dog takes the object, and when the dog is on her way back with the object. The goal is for the dog to come straight back regardless of what else is going on. Often dogs are most easily distracted when they are coming back with the object, but some dogs are also easily distracted on the way out, so remember to train both. Put the spotlight on the correct behavior and reward all good things the dog does! Build value for coming to you with objects by rewarding generously. If you were only going to work on one aspect of the retrieve training, you should work on delivery to hand! Add many different distractions to both the deliveries, the taking and the holding. Start with easy ones and gradually make them more difficult. 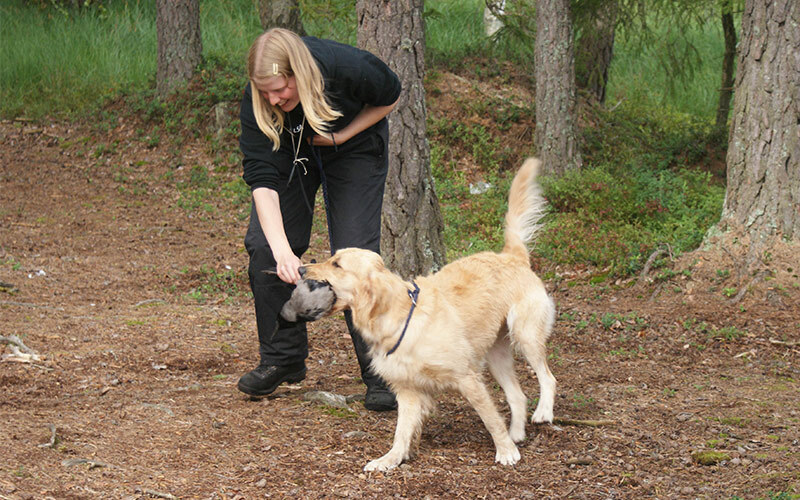 Elsa Blomster and Lena Gunnarsson are dog training instructors in Gothenburg, Sweden, and use only reward based training methods. They train and compete with their spaniels and retrievers in scent work and field trials, but have also trained and competed in obedience, tracking, rally obedience and agility. Together they’ve written the book Retrieving for All Occasions, that this article is based on. 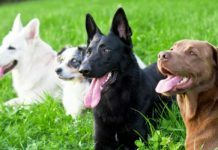 They also blog at Retrieving For All Occasions, where you also can see videos of several of the exercises in the article.